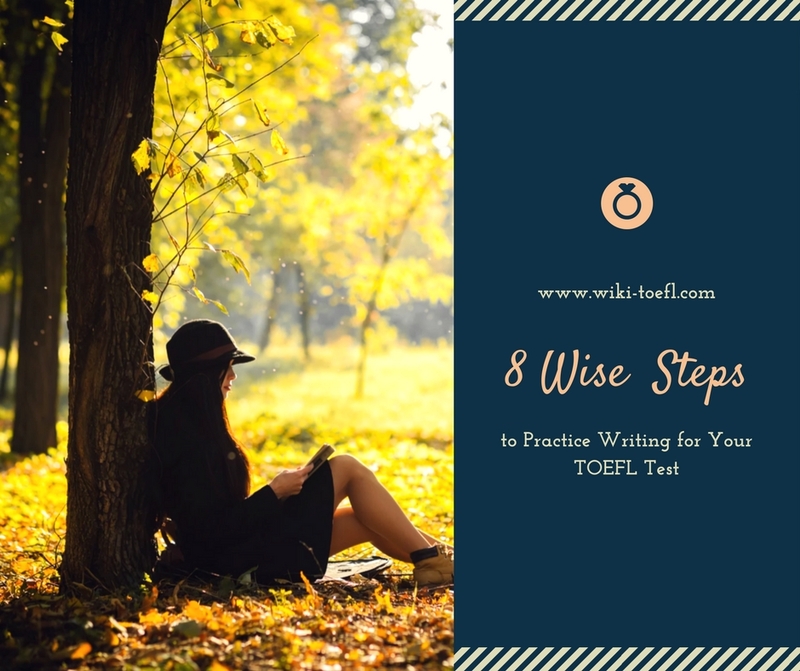 You may think that your writing practice begins with a piece of paper and a writing topic from a TOEFL test-prep book. But before writing a full essay, it is important to practice writing sentences and shorter paragraphs first. It is also important to understand certain concepts you will be using in your essays. To learn how to compose sentences, short paragraphs and short answers, look for some college textbooks, language books or online reading materials with follow-up questions after each story or chapter. Breaking News English is an absolutely wonderful website for this because it has a library of news articles, all followed by questions. If your favorite book doesn’t include questions, you can always ask a teacher or a friend to write you some. Read the stories/chapters carefully. Don’t just pay attention to the storyline and the main ideas, but also examine the vocabulary, sentence structures and grammatical features used. By observing and analyzing the English language, you will improve your understanding and can use what you have learned in your own writing. Don’t forget to take notes while reading. Who are the characters? What is the main idea? What happened? These are all questions you want to know the answers to. Underline and circle words or passages that you find important. Once you have read the text, answer the questions. Review your answers before checking the key for the correct answers. Ask a teacher or native speaker if you have questions about any of the answers. Being able to summarize is very important for your writing practice, your TOEFL test and your academic or professional career in English. But what does it mean to summarize? How is it different from quoting, paraphrasing or simply stating your own opinion? Let’s see. Quoting someone means that you share their words exactly as they were originally said/written. You must use quotation marks and include the name of the author. Remember the quote by Anaïs Nin up in this post’s introduction? Notice the quotation marks how we included her name. If you don’t use quotation marks but include someone else’s work in your writing, it is plagiarism—which is absolutely unacceptable. According to Anaïs Nin, when we write, we taste life twice: at the moment of writing and later when we read what we wrote. Summarizing is when you share the main idea of a story, book or article in your own words. Summaries are always shorter than the original text/story. Cinderella was forced to do work by her evil stepmother and two jealous stepsisters. One day a fairy used magic to allow Cinderella to go to a royal ball dressed as a princess. She met the prince, but had to run away at midnight because the magic spell ended. One of her glass shoes fell off as she ran. The prince found the shoe and searched for the girl. In the end, he found Cinderella because her foot fit into the shoe perfectly. They got married and lived happily ever after. As you see, when you summarize stories, books or articles, only the main ideas are important. Stating your own opinion is very different from quoting, paraphrasing and summarizing. The first three are all objective—meaning you share facts and stories as they are. Your opinion is subjective, though, which means it may differ from other people’s opinions. For example: I may think that Cinderella and the prince will be happy forever and have beautiful children, but you may believe that they got married too soon and will not be happy together. On the TOEFL test and in your academic or professional writing, you will be using all of these techniques. So make sure to always use the appropriate technique. After you finish reading this post, try using all four: quoting, paraphrasing, summarizing and stating your opinion. You can do the same with any other text for practice. Now that you have practiced short writing and understand some important techniques, you are ready to start writing practice essays for the TOEFL test. Create a list of potential topics now so that you won’t waste time brainstorming later. Think about topics you are interested in and know lots about. Are you passionate about the environment? Write that down. Do you enjoy traveling? The benefits of traveling could be a good topic for you. Skip topics you don’t enjoy or don’t know anything about. I don’t know much about cars, for example, so I wouldn’t write the auto industry as a potential topic. Then, choose debate and opinion topics. Think about controversial issues and start making a list. An opinion topic doesn’t always have to be deep, like abortion or gun control. They can also be simpler, like having more than on child in a family, having a pet or studying abroad. To help you out, the New York Times had published a list of 200 prompts for opinion writing, and the International Debate Education Association is full of ideas. Other websites, including TestMagic, Test Prep Practice,ETS , Wiki-TOEFL and Good Luck TOEFL are good resources for example questions, as well. Do you agree or disagree with the following statement? Social media websites, such as Facebook, Twitter and Instagram have made communication between people less personal. Use specific reasons and examples to support your opinion. Which one would you prefer: professional success or a happy personal life? Use specific reasons and examples to support your preference. You have one day to show a foreign friend around your hometown. Introduce him or her to your culture, historic places and food. Where would you take your friend on that day, and why? Use specific reasons and details to support your choice. Do you agree or disagree with the following statement? It is better to live on the university campus sharing a room with a roommate than living off-campus on your own. Use specific reasons and examples to support your opinion. Grab your list of topics and choose one. Then, spend about 3 minutes brainstorming. This means you read your topic and start thinking about it. What can you write about? What is your opinion about the topic? Do you have personal experience about this topic? Have you read any articles recently related to it? Write down your ideas on a piece of paper. You can use arrows to connect them, or even draw if it helps you. Don’t worry about writing full sentences, punctuation, grammar or spelling at this point. Just put down any words or broken sentences that come to mind. Once you are done brainstorming, then you can begin your outline. Creating an outline is perhaps the most crucial (important) part of your writing process. An outline is a document that helps you organize your main ideas so they connect logically. Your outline will tell you if you have enough evidence to support your main ideas. A good outline can guide you along through your essay, helping you build your story or argument in a logical and flowing manner. Writing your outline should take you about 7-9 minutes. Think about your outline as a list of headlines. When writing your outline, begin thinking about your spelling, word choices and grammar. However, short sentences or simply a few words are better than long arguments in outlines. Remember, you are not developing each idea, just listing them. I believe that it is very beneficial to have a pet at home because they provide companionship, they teach you responsibility and they support your exercise habit. A strong thesis statement usually includes the main idea (i.e. pets are beneficial) and supportive reasons (i.e. 1—they provide companionship, 2—they teach responsibility and 3—they support your exercise habit). Try to have two to four supportive ideas. List sub-points for each supportive reason. Don’t just list the reasons themselves, but jot down ideas of facts, opinions, strong arguments and/or examples to include with each. Think about the questions “Why?” and “How?” when developing your supportive ideas: Why and how is this point supporting your thesis statement? Try to have at least three sub-points for each supportive reasons. Once you are finished with your outline, the most difficult part is over! You can start writing now. Follow your outline format closely as you are developing your essay. Begin with an introduction. Your introduction can be a quote, a short story or even a funny joke related to the topic. Be creative. End your introduction with your thesis statement. In the body, you will now expand on the supportive details from your outline. Considering that pets provide us with companionship, teach us responsibility, and support our exercise habit, I believe that having a pet is beneficial to everyone. If you don’t have a pet yet, I suggest you consider getting one. If interested, go to your local humane society where you will find many loving dogs, cats and other animals in need of a good home. Aim to write your essay in about 7-10 minutes, followed by 5 minutes of review. This means you will spend around 25 minutes total per essay: brainstorming, creating an outline, writing and reviewing. During this time aim to write 300-350 words. Being able write a 300- to 350-word essay within 25 minutes will be beneficial on your TOEFL test day. If you need more time or your essays are too short at first, don’t worry. You will improve with time. Just notice where you are at now and where you need to get better. Ask for help when you need it; your teacher or study buddy will be happy to support you. As we briefly mentioned above, once you are finished writing your essay, go back and review your work. Try to take only 5 minutes to review and to edit. Read your writing again slowly and carefully with high attention to detail.Check your grammar, your spelling and your word choices. If you are typing, spellcheck and Grammarly are there to help you. If you notice a mistake, correct it. Don’t be afraid to cross out a word or entire sentence to revise it. If you notice repeated words, try to replace them with synonyms. For example, if you use the word “strong” five times in your essay, replace four of them with an appropriate synonym: “active,” “hardy,” “muscular,” etc. If you don’t know any synonyms, check your thesaurus. If you are unsure about your spelling or word choices, consult your dictionary. During the TOEFL test, you won’t have the option to check your dictionary or thesaurus, but while you’re practicing it is a good idea to do so. When it gets closer to your test date, though, practice writing a few essays without a dictionary or thesaurus. Take note of anything that was confusing. Knowing the areas that you need to pay more attention to or review again will help your progress. Once you are finished writing, reviewing and checking, it is absolutely necessary to ask an English speaker—a native speaker or anyone with native-like expertise—to review your work. Remember, they speak English fluently, and will be able to point out all your tiny mistakes. Besides, four eyes see more than only two. You can use Lang-8 to check your writing. Native English speakers will edit your essay for free. In return, for good karma, you can review the writing of other members who are learning your native language. Of course, working with an English teacher one-on-one in person or online is even better, as it provides you with further opportunities to discuss your concerns, and get specific assignments to strengthen your weaker areas. Once someone has reviewed your work, rewrite your essay by correcting your mistakes. Then ask for another round of corrections to see if you have missed something. Take note of your mistakes. I cannot emphasize this enough. Review the areas that you had mistakes in, and clarify any questions. Continue focusing on expanding your vocabulary as well. A week or two later, write about the same topic again to see how much you have improved. Use these steps to practice your writing 2-3 times each week. Your writing will greatly improve, allowing you to score higher on the TOEFL test and to write better for the rest of your life. Good luck and have fun!